In this post, we will talk about how to add / modify the default fields which are automatically created when creating a new table in FileMaker 17. It will only work on FileMaker 17. 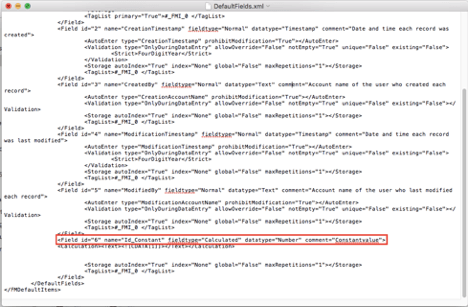 Initially, there is an XML file already available on the system where the FileMaker 17 software is installed. It is named as “DefaultFields.xml”. This file will create 5 default fields when creating a table in the FileMaker 17 database. 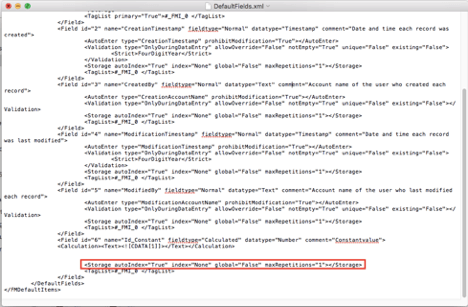 We are able to modify the XML code in that file, which will help to add more fields when creating a table in the FileMaker database. In this post we are going to show how to add more fields. If you are using a mac machine then you can get the xml File from the following location. If you are using Windows machine then you can get the xml File from the following location. In that XML file, already there will be a XML code to generate five default fields. Now I am going to modify the XML code to add new Field. If we want to add a new Field then we need to add the “Field tag” in the file. Inside the “Field tag” we can specify the Field Name, Field Type and also Datatype of the field. For Field Name, “name=”Field Name””. For Field Type, “fieldtype=”Field Type” “. For Datatype of the field, “datatype=”Datatype””. For Calculation formula, we need to enter the calculation as given below. Here I have given the value as “1”. For Field Storage, we need to enter the storage values as given below. here i have mentioned “global” as “False”, “autoIndex” as “True” and “maxrepetition” as “1”. 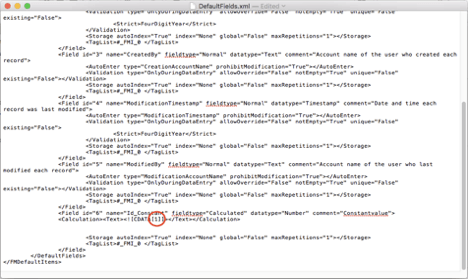 After modifying the XML Code, Save the XML file with the same name as “DefaultFields.xml” in the same location. Now if we create a table in FileMaker, then it will create a default fields and the calculation field with the value of “1” as default and named as “Id_Constant”. FMDBSolutions is a team of well-qualified experts that have a lot of experience with the many versions of FileMaker Pro and the FileMaker Go app too. You can also leave us your email below for receiving new updates regarding FileMaker and our company.